My Creative Spiritual Revolutionary interview with Laura Hollick for Soul Art TV is now up! Laura asks some great questions about what inspired me to start blogging and how blogging has helped boost my art career. You can watch our interview here. 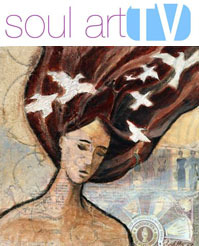 Be sure to check out all of Laura's fabulous Soul Art TV interviews with creatives while you're at it! HI! i was just sent a link to your interview by a friend and am so excited to find this challenge. For the month of February I have been involved in a group on flickr which is about creating something everyday for february. the challenge has kept me so motivated and i am excited to join your group to continue this challenge for the rest of the year! Just watched your interview with Laura & it was fab. Informative, friendly, interesting & I’m sure it will leave people who haven’t heard about you wanting to learn more. Even though I’ve read about/blogged/emailed with you(& not long ago interviewed you myself) I learnt more about you which was great. You were very natural in the interview & didn’t appear at all flustered like I fear I may have been in the same situation. Good work! And I liked the freebie about how blogging helped your art career. Oh and exciting to see the bump at the end. I can imagine your baby girl waving at the camera too :-0 My daughter is sure she had a view of the outside world when she was in my tummy. She apparently linked up a camera to my tummy button. Lol. And when asked at school last week if she’d ever been on a plane she quite matter of fact said yes even though she had to then admit she was in my tummy at the time Guess she’s inherited her mum and dad’s imagination! Leah you are such a beautiful creative spirit. I am endlessly inspired by your brilliance! You are going to be a fantastic mother! That’s great Leah, I’ve checked out her site a few times, it’s a great project. I’m off to watch! Leah, It was a wonderful interview! Congratulations. Your interview and report were great, Leah. I especially liked your tips on how to keep your blog interesting and what people like about the process. Great interview, Leah! Congratulations on all the amazing work you’ve done over the past 10 years and to inspiring so many of us to join you. Wishing you and your family all the best as you bring your daughter into the world. I like the interview too. And in particular Leah, what you said about having quite a few patrons of your beautiful art from the Pacific Northwest. This is where I live, and I can tell you without a doubt in my heart that your art lives and breathes the beauty we live in everyday here in the Northwest. The trees and the whales, the waters, and lots of beautiful women! The Tree Spirits here are rooted in the images you create! It is truly a connection of souls! Thank you for inspiring me to grow my connection to artists everywhere!